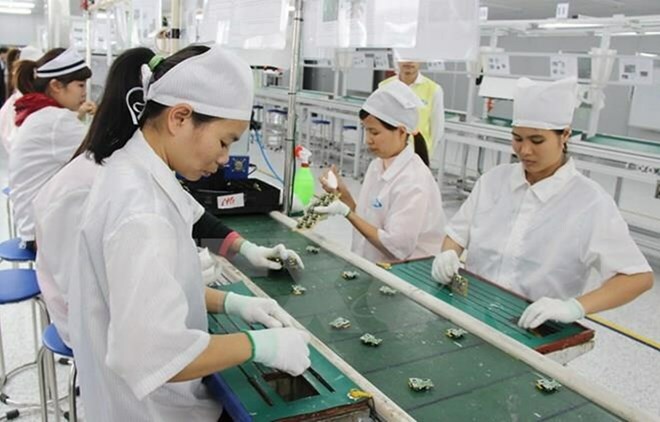 Hanoi (VNA) – Foreign direct investment (FDI) registered in Vietnam during the first quarter of 2019 hit the highest level since 2016, according to the Foreign Investment Agency (FIA) under the Ministry of Planning and Investment. As of March 20, foreign investors had registered 10.8 billion USD in new and additional capital and capital for buying shares of domestic firms, up 86.2 percent year-on-year. This included 3.82 billion USD for 785 new projects, rising by 80.1 percent. However, capital pumped into existing projects, at nearly 1.3 billion USD for 279 existing ones, was equal to only 72.5 percent of the figure in the corresponding period last year. About 5.68 billion USD, or 52.6 percent of the total figure, was registered to buy shares, three times the figure of one year ago. Foreign investors poured money into 18 sectors, with 8.4 billion USD or 77.7 percent channelled into processing and manufacturing. Real estate (778.2 million USD) and science-technology (383.2 million USD) came second and third in terms of FDI attraction. The FIA said 74 countries and territories invested in Vietnam in the first quarter. Hong Kong (China) topped the list with 4.4 billion USD, followed by Singapore (1.46 billion USD), the Republic of Korea (1.3 billion USD), China (1 billion USD), and Japan (700 million USD). Meanwhile, FDI capital flowed into 49 provinces and cities. Hanoi was the biggest destination, attracting over 4.15 billion USD. Ho Chi Minh City and Binh Duong province followed with 1.57 billion USD and 625.6 million USD, respectively. Between January and March, 4.12 billion USD of FDI projects were disbursed, up 6.2 percent from the year previous. According to the FIA, the foreign-invested sector exported 41.45 billion USD worth of goods, including crude oil, during the three months, rising 2.7 percent year-on-year and accounting for 70.8 percent of Vietnam’s total exports. Excluding crude oil, the figure stood at 40.95 billion USD, up 2.8 percent and making up 70 percent of the total shipments.